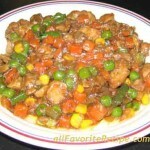 Tinolang Manok or Nilagang Manok (Chicken Ginger Stew with Vegetables) recipe is the filipino food dish that I was planning to cook when I arrived here in Canada. Tinolang manok recipe is a filipino food that is easy to cook but during that time, I don’t know where to buy filipino ingredients specially papaya, sayote, chili leaves or malunggay and I thought that I couldn’t cook filipino food dishes anymore. But as I got familiar to places here, I’ve notice that cooking in Canada is not that difficult, as I have taught before. We even travel for an hour from our place just to buy filipino food ingredients. These filipino food ingredients are usually sold in Asian stores but some are not that often displayed. So, looking for a substitute is my next best option. Like this tinolang manok recipe, when I went to my favorite Asian store, the frozen malunggay or the chili leaves that I notice before are not there to be found, so I just used the spinach because they are abundant and it was recommended by a friend of mine. Cooking away from your native country is challenging but enjoyable, especially when you are with your love ones. Happy Cooking! 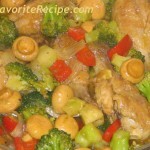 Have You Tried These Other Easy Chicken Recipes? really yummy, I added more spinach….! thanks! didn’t know cooking tinolang manok would be this easy! paborito ko ‘to, love to cook and eat tinola!!!! missing pinoy food trip, thanks for this site it helps alot. Aloha, Papaya grows here in Hawaii and so does malungay. In fact these two trees grow like weeds here and bear fruit very quickly. So Tinola is very easy to have on these islands. buti na lang nakita ko tong site na to. nagluluto ako ng tinola tapos wala pala akong chicken broth or chicken buillion. buti di pa ko nakasaing at ung pinaghugasan na lang ung ginamit ko. thanks. 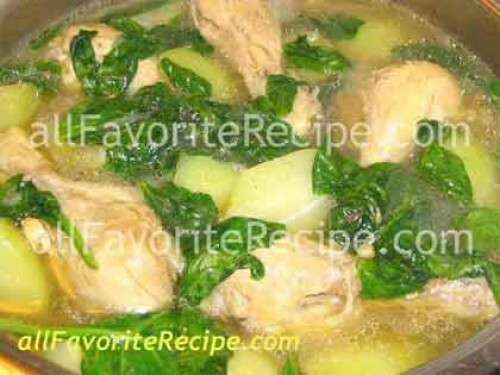 TINOLA is one of my favorite dishes,,everytime i cook this i put more ginger to sharpen the taste,,yummy!!!! its my first time to cook and i tried to cook this one and it’s very easy to cook with the help of your cooking procedures… i really love the taste, especially i was the one who cook… hahaha… thank you so much! tnx very much ur website helps me a lot .. I also cooked this when I went to the US for a month… My american bf and his mom really love it! I will definitely cook this again when I go back. Madali lang kasi ako nakahanap ng sayote…kaso wala talaga akong maitang “dahon ng sili”. Thanks for giving me an idea na pwede pala ang spinach as a substitute. Oh wow. Didn’t know sayote was chayote squash. I’m literally eating this right now, minus the sili. Thanks for the info! Thanks for the info re ingredients substitutes. cause i really have a hard time finding filipino ingredients. ive been wanting to cook tinola. ill try to used spinach instead of malunggay. This was exactly how my mom made it! Super delicious, thanks!